This July, I participated in a weeklong internship at the Ministry of Health, Labor and Welfare’s International Affairs Division. During the internship, students who participated in internships at health care-related divisions, joined meetings in our divisions, took some lectures about our health care system, and made a short presentation on the last day with our leanings. We also had opportunities to speak with officials during lunch and ask questions. One reason why I applied for the internship is because I wanted to see the process behind the creation of a new policy or proposal. Even though I have opportunities to discuss the issues on public health at my university, I always feel that it is just desk theory. It is difficult for us to consider all the stakeholders related to the issue, and we tend to focus with a limited perspective. However, during the internship, although students cannot work on the actual process, we could see professionals at work and learn from our observations. I had actually assumed that the system in the ministry was rigid and that the relationship between the boss and employees were too strict. However, I saw that officials were able to exchange their views actively and that they positively shared information. In division meetings, they shared information on the current issues each of them was facing, such as antimicrobial resistance (AMR). I felt that it was this atmosphere and meetings that enabled the division to tackle a broad range of topics. The other reason why I participated in this internship was that I wanted to ask the officials not only their current work, but also their career. To my surprise, I learned that officials are transferred between the divisions or ministries about every two years, until 16 years pass since their entry into the MHLW. They are transferred in order to experience all areas of work within the MHLW and learn how the ministry functions as a whole. For me, this did not sound appealing at first, because officials cannot necessarily work on what they are interested in. However, one of the officials told me that having connections with employees outside his division is very interesting, and that he enjoys being able to work with his old coworkers when he returns to his former division. Moreover, he said that he can save many people as an official of MHLW, while he could only save one patient at a time as a practical physician. These words impressed me and I understood their passion and motivation. 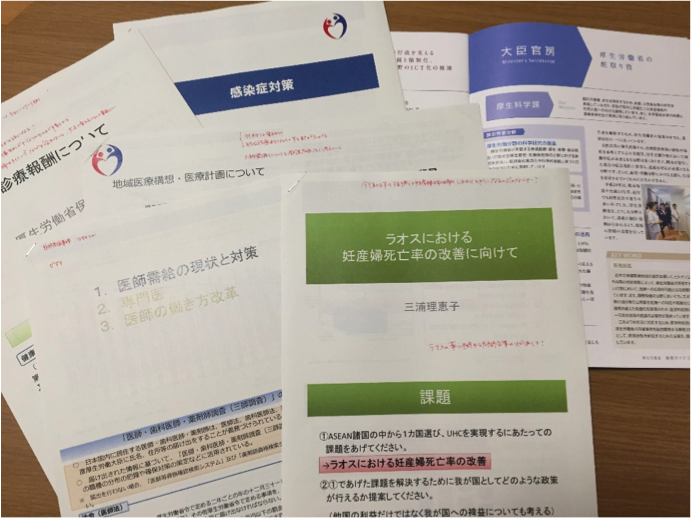 It is said that Japanese health care system is developed and that Universal Health Coverage (UHC) has been achieved in Japan. Japan should be a role model for other countries in this field and the MHLW is currently planning to develop human resources for this intervention. Although I am still thinking about how I should work as a doctor in the future, the experience of this internship gave me a concrete image of the MHLW and its work, leaving me with some valuable hints for my career plan.